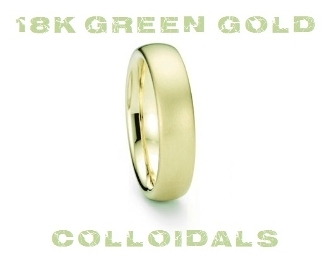 Green gold was known to Lydians as long ago as 860 BC under the name electrum, a naturally-occurring alloy of silver and gold.It actually appears as greenish-yellow rather than green. Fired enamels adhere better to these alloys. Cadmium can also be added to gold alloys but there are health concerns regarding its use.The alloy of 75% gold, 23% copper, and 2% cadmium yields light-green 18-karat gold. The alloy of 75% gold, 15% silver, 6% copper, and 4% cadmium yields a dark-green alloy. Since Cadmium is a known poison I opted not to get these alloys.